at long last we have a place of our own for a to-the-studs project! we could not be more thrilled. 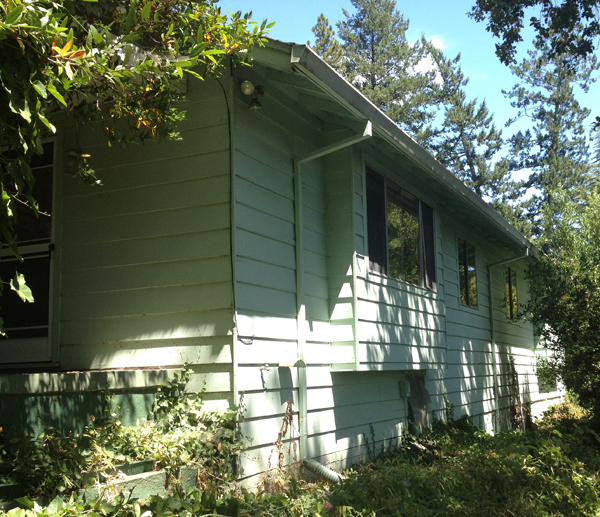 this woodsy little confection was built in 1963, at the tail-end of the mid-century era, in the California Sierra foothills. after a 3-month search through the pine forest with our realtor, we settled on the one: it was the right size (800 sq ft) not oversized like some ski-houses tend to be; in a good location we’ve visited with friends – it has access to a lake; and most importantly because it hadn’t really been touched much since the 60s and needs work – nothing major, but work that we’re anxious to do. a real vintage fixer-upper. below are photos of the other sides. 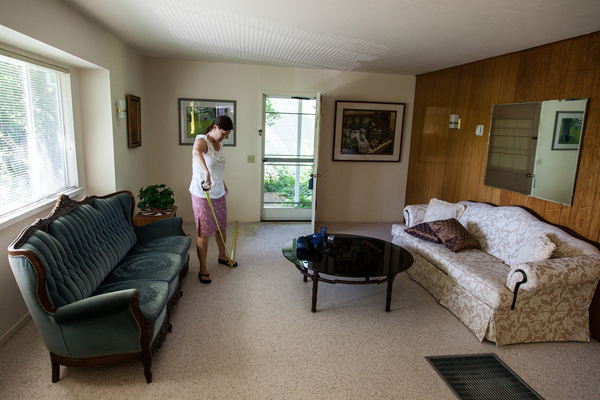 it was affectionately referred to as ‘cigarette house’ by our realtor because it was beyond saturated with the smell. but that only ‘fueled’ our interest more – we knew we could do a job on it. I like the board-and-batten siding but not the lemon color. so un-woodsy! it’s nestled into a gentle hill with a deck in front and a cute guest cottage / toolshed out back – perfect for our unwanted guests lol! I assume it was used for sleeping because it’s insulated, carpeted and has lighting. Inside the house, it’s wood-on-wood-on-wood. 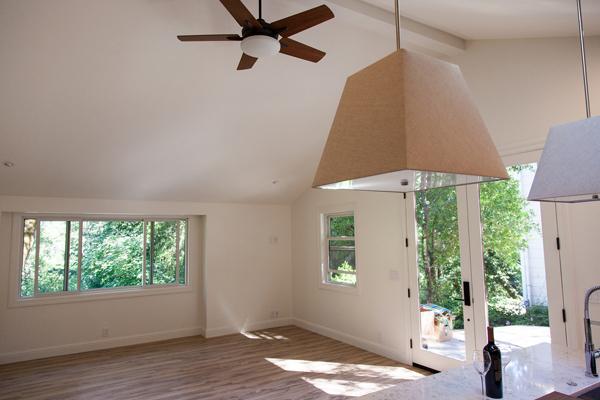 another big selling point was the vaulted, knotty pine ceiling….which we love and think really makes the cabin. there are three truss-beams running through the living area. my engineer colleague took one look and said they’re not structural. but we’re keeping them, of course. the kitchen is quaint, and came with no refrigerator. that’s OK – we have coolers, for now. seems like a mircrowave was taken too – but we don’t care – less things to throw out because it would probably not been one we liked the look of. the cabinets are not original, maybe one of the only things updated in the house, but they’re OK for now. we have plans. 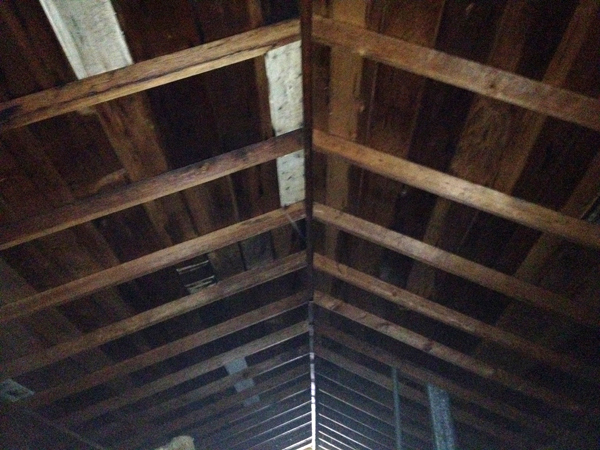 in the bedrooms, the vaulted ceiling disappears….WTF. why are these ceilings flat / dropped? the first time I saw this, I was certain that the vaulted pine must continue above, and this is only a cosmetic lower ceiling. we also did not love the built-in closets that took up floor space in the cozy bedrooms. how about those faux-wood accordion doors? oh my vintage! there’s no way they’d make the cut. The Bathroom…pretty basic…you can’t tell but the toilet is on an angle – we’ll call it the V8 toilet. I’m glad there’s a wall-hung sink, I often prefer them over vanity cabinets that can make a small space feel cluttered (like that shelf!). even the toilet seat was wood-grain. the entire bathroom was paneled, ceiling and all. I actually like this curved-corner medicine cabinet and think with a little spray-paint it can stay. that outlet is not GFI = good thing I don’t use a blowdryer 🙂 some fun light fixtures. old-west scalloped realness above, and the lower one is the same as was in my childhood bedroom – and I’m sure many bedrooms across the USA.. the original wood wall paneling: to keep or not to keep?? it’s ‘real’ wood, as in very thin sheets of plywood. not plastic printed woodgrain that came along later. this is genuine wood..and wood makes the CABIN. we are at once charmed by it, and yet could also see painting it white to brighten the place up. for now we’ll keep it, other things to do first. we’re also unsure if all exterior walls are insulated. the ‘Woodsman’ fireplace is so damn awesome. we’ve already built many fires in it. we like to think we are becoming woodsmen…ha. vintage moment: maybe we should keep the paneling in the bathroom? she doesn’t seem to mind it. and as for this short, but obtrusive wall: I suspect there is a structural post within it, supporting the ridge beam. but it’s in a bad spot. we think this is where a refrigerator once was (on the kitchen side) but we don’t plan to put it back there. this wall irks us but I have a solution. your homework is to think about the paneling! should it stay or should it go?! more to come! 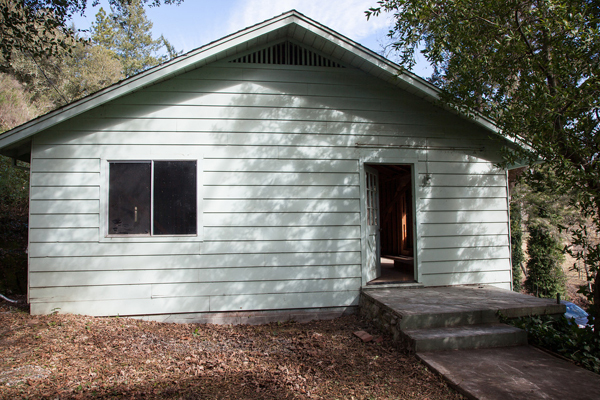 This soggy little home has squatted above a creek in Napa’s countryside for about 50 years. It was once 2 mirror-image units, then combined into one with an awkwardly large kitchen. My clients converted it back to 2 units, one for their own use, one for a rental. 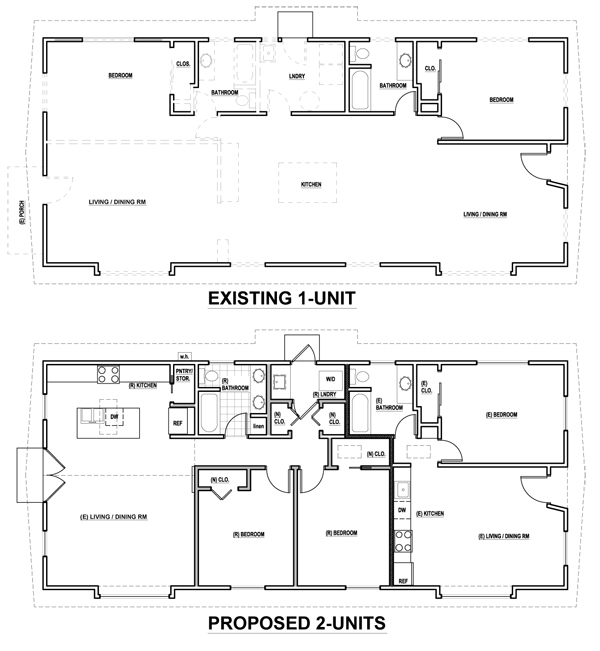 Here is how it looked just as the remodel was completed: The plans below show the before/after layout. The owners wanted to achieve an open plan and 2 bedrooms in their half. 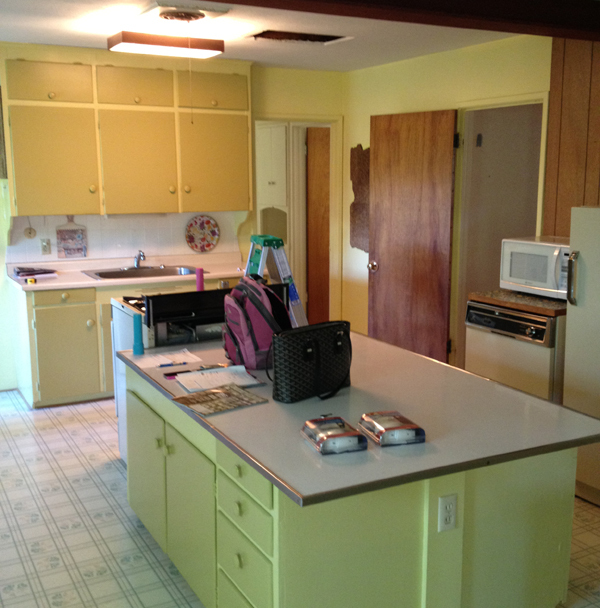 Here are some ‘before’ photos – the beam in the kitchen shows where the 2 units used to be divided: What’s a fixer-upper without wood paneling?! 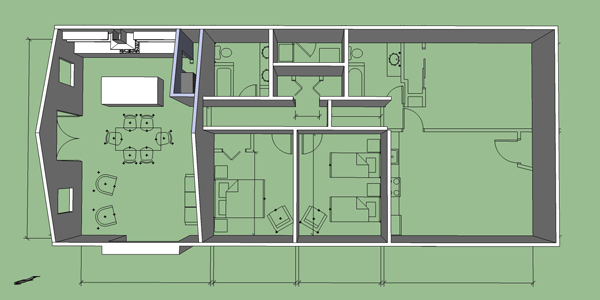 As we came up with a few schematic plans, I couldn’t resist the pitched roof and empty attic above the flat ceilings: Why not take advantage of this? 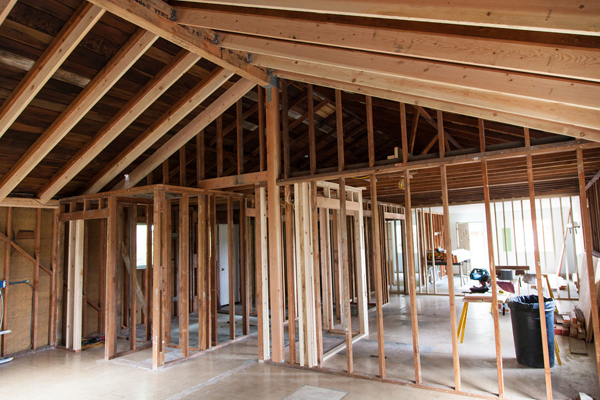 Of course it would have to be re-framed; its 2×4 rafters at 30″ on center with only a thin plate at the ridge wouldn’t span the width of the building… The idea was to vault the full width of the house at one end over a ‘great room’ with flat ceilings everywhere else. 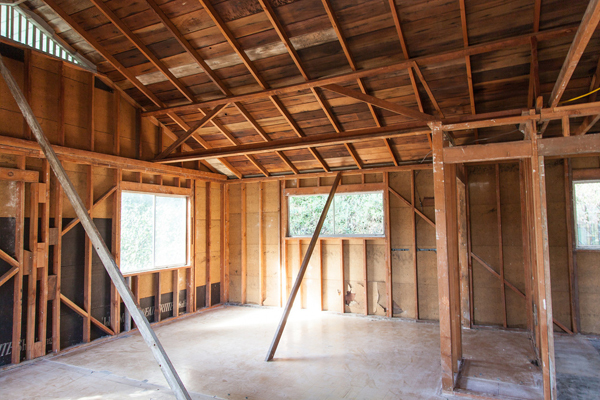 What a difference to see it opened up. . my client really wanted to keep the wood planks exposed but it would be a more complicated rebuild than they wanted to embark on. So the new framing dropped below the old 2x4s. Below is the new framing and where the vaulted ceiling meets the flat ceiling, so there would still be an attic over most of the building. 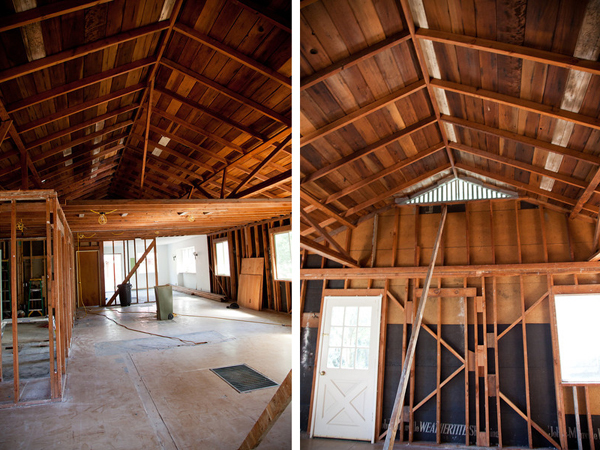 Below, the house just after completion: This is the vaulted-ceiling great room. 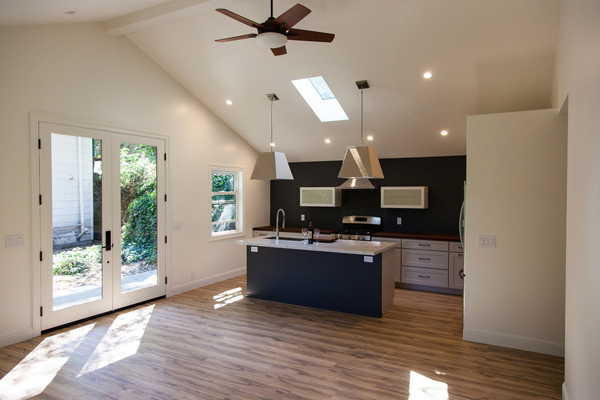 I pushed for windows above the doors, but the owners didn’t want neighbors looking down into the room… The 8′ tall doors show where the flat ceiling used to be, now room soars to 13′ at the ridge beam. 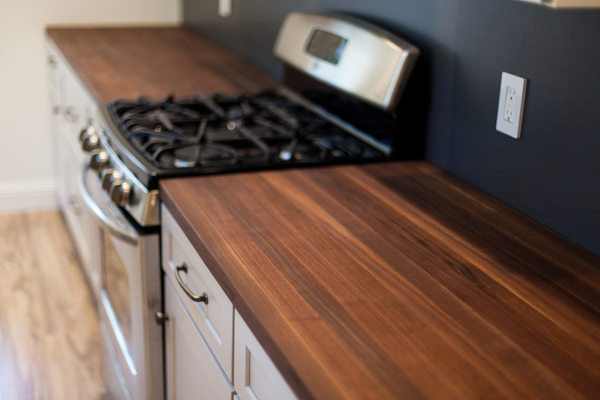 Smart decisions such as butcher-block counters were selected without blowing the budget. 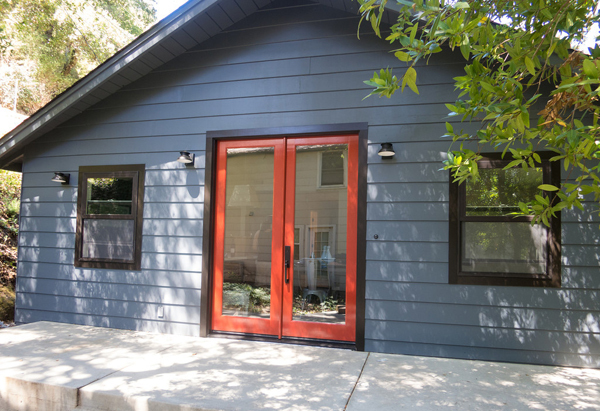 Below, another before/after angle—-> The color palette instantly launches the house into modern day although it’s the original wood siding. 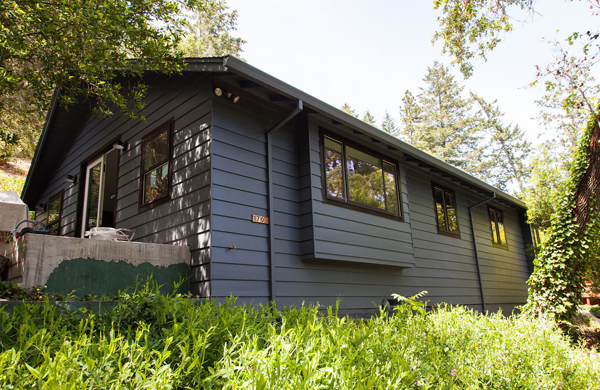 New dark aluminum-clad windows add to the depth of the house. The small stoop grew into a patio that will have an overhead trellis for shade and privacy. I’ve been invited and can’t wait to spend an evening there!